bl.uk > Online Gallery Home	> Online exhibitions	> Asia, Pacific and Africa Collections	> Kashmir: Gulab Sing. Plate 1 from "Recollections of India. Part 2. Kashmir and the Alpine Punjab" by James Duffield Harding (1797-1863) after Charles Stewart Hardinge (1822-1894), the eldest son of the first Viscount Hardinge, the Governor General. This depicts Maharaja Gulab Singh (died 1857) who started his career as a soldier under Maharaja Ranjit Singh (1792-1839) and rose to a prominent position at his court. During the first Sikh war he forged an alliance with the British and defeated Sikh groups vying for power after Ranjit Singh's death. After signing the Treaty of Amritsar, 1846 he became Maharaja and bought the territories of Jammu and Kashmir which occupied an important position in the political geography of India. 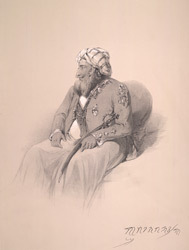 The British needed a friendly power by which the Northwest frontier could be defended against the Afghans.